The next generation workforce is a bunch of young whippersnappers who don’t know what they’re doing. They sleep in, slack off, and refuse to contribute in a meaningful way. They have no loyalty and only care about themselves. In fact, they don’t even look up from the screen of their device of choice to realize there are other, actual people around them. And they need to get off my lawn. 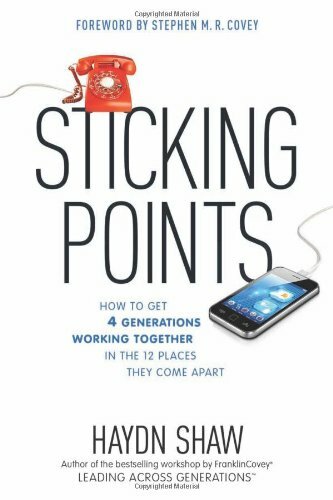 Okay, so, STICKING POINTS doesn’t exactly say all that, but this is a poignant look at the generational misunderstandings that occur each and every day in offices all around the world. People retire later in life. Young adults opt out of college more often. The workforce currently contains members of four generations for the first time in history. And, with each generation, comes a different set of motivations, work ethic, outlook, perspective, and more. This can make for a very confusing and, at times, aggravating workplace. Or, it can make for a vibrant, productive experience that can lead to new products and technical advancements. Craft does a good job of explaining some of the differences and challenges this generational mix can present, as well as some methods for thriving in such a diverse environment. What I took away from this book most, however, was the affirmation of a Biblical concept: each generation is a direct result and response to the generation before. Whatever we teach those following us – whether intentionally or by default – is what they carry into their lives as they define their generation.